At Lost Era Access, we want to share our love of history in ways that will affect our daily lives. Our goal is to bring the past closer to the present, making it relevant again with a fresh and creative spin. We consider history as a paradox. So much of what we want to know is forever lost, and the small amount of knowledge we have is presented in a way that keeps it at arm’s length. We are not just interested in timelines, memorized facts, and other hard data—we are also intrigued with how people lived before. In fact, we see the present as an evolved version of the past, and we are determined to bridge that distance. Our vision is lofty, yet simple. We want to see the world and its people interconnected to a living, breathing, and relatable history. Our mission is to forge bonds between modernity and antiquity. We aim to achieve this by bringing history into your daily life through our educational products. Instead of keeping the past at a distance, we strive to bridge the chasm between the viewer and the subject. We want to make the past feel like the present. We were motivated to start this company by the ability of Chet and Lindy Downs to open a window to the past through their Mexican Revolution Calendars. Their fascination with history has had a major influence on us. As a result, our current path is dictated by nostalgia and curiosity—both of which are essential to a company that looks at the previous century for inspiration. Our team wants to create products that we truly care about—making a profit is the least of our concerns. Given this, we have decided to come up with a similar calendar that reflects our love for history and keen attention to detail. 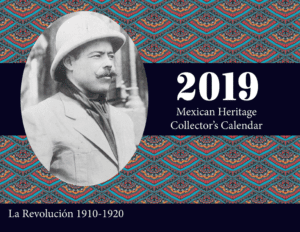 The 2019 Mexican Heritage Collector’s Calendar is now available. This calendar signifies our passion for history and our unshakable belief in what we do. Many of our customers are from the Southern and Southwestern United States. Order a copy today!